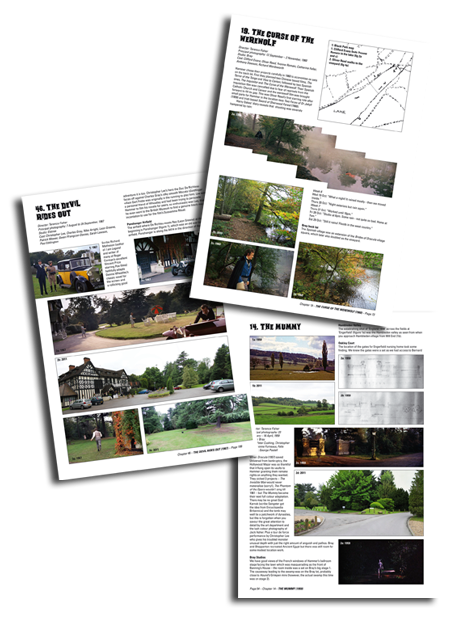 A film by film location guide (61 chapters) from Four Sided Triangle – To the Devil a Daughter taking you through practically every location used. We take you inside a number of private properties (with their owner’s consent) to show you many Hammer locations now hidden from the public. Stitched binding for extra strength on your many location hunts! 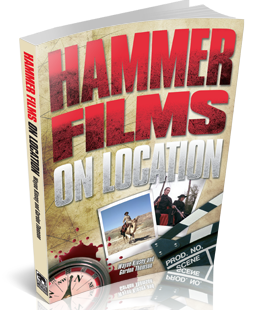 Where your favourite Hammer films were shot? How to pinpoint Hammer locations in their favourite haunts such as Black Park, Bray gravel pits, Chobham Common and Frensham Ponds? Which locations are long gone or on private property and which are still worth a visit? Where the oft’ discussed coach road from Dracula really was? Whatever happened to the Bray church site from Captain Clegg or the old cottage from The Reptile? That Hammer didn’t always film in the clichéd penny pinching style we’re often told about; when they could easily have only used one, the scene where Frankenstein’s carriage almost runs over the beggar girl in The Evil of Frankenstein was a composite of 3 different locations; Chobham Common, Bray gravel pits and the Bray back lot. That numerous trees seen in Hammer films in Black Park have survived to this day, including the tree where Christopher Lee gets kebabed against in Pirates of Blood River, the bent tree in the background when the travellers approach Dracula’s coach in Dracula Prince of Darkness and even some when the coach arrives at the beginning of Brides of Dracula! That a single road with a dip in it appeared in Kiss of the Vampire, The Scarlet Blade, The Evil of Frankenstein, Dracula Prince of Darkness and Twins of Evil.